1. de Boer J, De Meester J, Smits JMA, Doxiadis IIN, Groenewoud AF, Persijn GG (1999). Eurotransplant randomized multicenter study comparing kidney graft preservation with HTK, UW, and EC. Transplantation in press publication about December 1999. A multi-center prospective clinical study was carried out in Europe to evaluate the performance of the HTK solution in liver transplants.2 Four transplant centers participated. 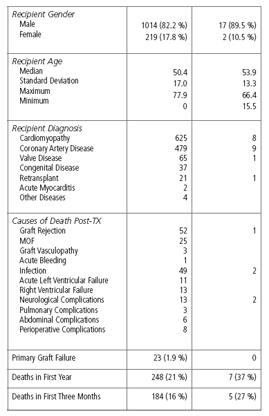 228 livers were included in the study (205 were initial transplants, 23 were re-transplants). This trial took place during 1996-1999 under the auspices of Eurotransplant. The four transplant centers participating were: Innsbruck Transplant Center; Vienna Transplant Center; University Clinic, Essen; and University Hospital, Göttingen. The (patient) survival rate at one year observed in this study was 82.5%. The following table shows the patient survival at different times in the direct comparison study at Essen, the four-center prospective study, and the Hanover retrospective study. These data show that the patient survival rates for HTK-preserved livers are similar to those for UW-preserved livers. 2. Pokorny H, Grünberger T, Rockenschaub S, Windhager T, Rosensting A, Lange R, et al (2000). Preservation of the liver with HTK–a multicenter experience. Poster presented at International Congress of the Transplant Society, Rome, Italy. 3. Fridell JA, Agarwal A, Milgrom ML, Goggins WC, Murdock P, Prescovitz MD (2004). Comparison of histidine-tryptophan-ketoglutarate solution and University of Wisconsin solution for organ preservation in clinical pancreas transplantation. Transplantation, 77:1304-1306. 4. Potdar S, Malek S, Eghtesad B, Shapiro R, Basu A, Patel K, Broznick B, Fung J (2004). Initial experience using histidine-tryptophan-ketoglutarate solution in clinical pancreas transplantation. Clin Transplantation, 18:661-665. 5. Riege R, Büsing M, Kozuschek (1999). Preservation of the pancreas for transplantation. Transplant Proc, 31:2095-2096. * In the study reported by Wieselthaler et al., only 9/24 of Custodiol® – preserved hearts returned immediately to normal sinus rythm, following reperfusion, compared to 19/24 in the Celsior-preserved hearts. However, in the larger study by Reichenspurner et al., 87 % of 137 Custodiol® -preserved hearts returned immediately to normal sinus rhythm. It is not clear why these two studies showed such different results, though it may have been partly due do the larger numbers of cases of donor heart dysfunction in the HTK group. A clinical trial of Celsior solution was carried out during the 13-month period May 1997 through May 1998, and was reported by Vega et al.8 The data from Bad Oeynhausen (discussed above) during this same 13-month period was reanalyzed separately from the larger population for purposes of comparison with Celsior. 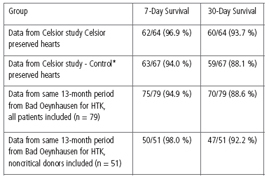 79 patients were transplanted during the period at Bad Oeynhausen and the 7- and 30-days survival values for Celsior and the control solutions from the Vega study, along with the data from the same period from Bad Oeynhausen, are shown in the following table. It should be noted that the Bad Oeynhausen center accepts some donor hearts that would normally be rejected by other centers. The data are presented both with and without so-called “critical” donor hearts (e.g., those with cold ischemia time above 240 min, donor age greater than 50 years, etc.). Without the “critical” cases, the acceptance criteria for the Celsior study and the Bad Oeynhausen non-critical cases are more similar. 7. Wieselthaler GM, Chevtchik O, Konetschny, Moidl R, Mllinger E, Mares P, Griessmacher A, Grimm M, Wolner E, Laufer G (1999). Improved graft function using a new myocardial preservation solution: Celsior. Preliminary data from a randomized prospective study. Transplant Proc, 31:2067-2070. 8. Vega JD, Ochsner JL, Valluvan J, McGiffin DC, McCurry KR, et al. (2001). 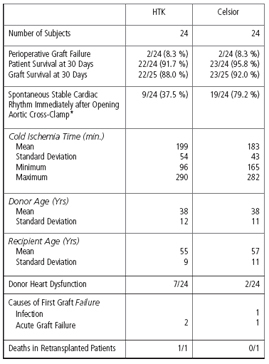 A multicenter randomized, controlled trial of Celsior for flush and hypothermic storage of cardiac allografts. Ann Thorac Surg, 71:1442-1447. * The “control group” in the Vega study consisted of the pooled data from several different preservation solutions – whatever the center happened to use prior to the study. The solutions included UW, Roe, Ringer’s lactate, normal saline, Plasmalyte A, Plegisol, Carmichael’s, Stanford, and others.